March 20, 2003 -- The toxic mold that was considered a serious environmental threat in the damaged Deutsche Bank building has been removed, city officials said this week - potentially clearing the way for a decision on what will happen with the black-shrouded wreck that looms over Ground Zero. "I wouldn't think the building would pose a health problem as far as mold . . . I didn't see any evidence of that," said Chris D'Andrea, a research scientist for the city Health Department who conducted a top-to-bottom inspection of the Liberty Street building on March 5. The Deutsche Bank building was damaged in the 9/11 attack, when debris from the Twin Towers cut a 14-story gash in its north side. Rain and basement flooding led to a mold infestation, which local residents feared could spread to other buildings. The bank has been fighting with its insurers over what to do with the empty hulk. The options are razing it, repairing it or selling it. Raze that sucka! *That and the little buildings next to it (I think) would be perfect for 2, glass, mixed use towers - office and residential, and, maybe even the marriott so the WTC site would be less bogged down with requirements. I am really surprised that they were able to clear the mold so easily, after all the articles that described how widespread and virulent the infestation was. Something smells about this (more than toxic mold). quality around the site after 9/11, this weak statement is not going to be accepted. I too am surprised at the speed of cleanup, but all this means is that the building can be unsealed (for whatever plan). It will probably still need to be competely gutted. I also hope they take it down. This building will probably be transformed but not demolished. No matter what Libeskind plans for the site. Notice how similar number 8 is in massing to 130 Liberty. Adding a sloped roof on top and a completely new facade would make it very, very similar. #8 is really Libeskind's Tower #5. *Yes...the massing is approx. the same but raising Liberty 130 is best and that is what Deutsche Bank wants but is fighting with its Insurance firms. *If it can get the money, it will be razed. *Hopefully...that black box is UGLY!!! Whatever happens to the building, it's doubtful that Deutsche Bank will move back in. 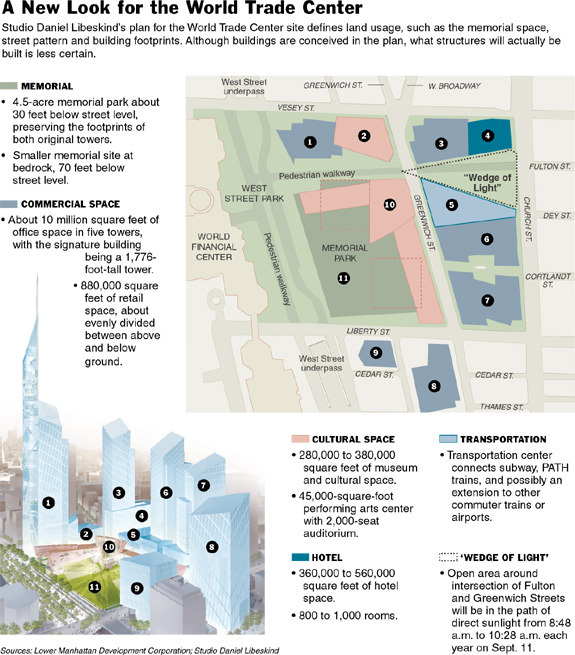 They lost 1.8 million sq ft of space downtown at 130 Liberty and 4WTC. will become the new US headquarters (1.6 million sq ft). Buildings are more than facades and this is an opportunity for real improvement. I doubt refurbished offices would be very desirable. I don't mind black boxes, but this one looks plain and cheap. And it's a prime site that should be taken advantage of. Silverstein would like to build a 1500' tower there? Is this connected to the WTC or is it a separate project? Silverstein's "Memorial Tower" concept has been obsoleted by the Libeskind Plan. Seriously, would they really implode a building on that site? *Might it be too much of a reminder of 9/11?